I'm usually a traditionalist when it comes to potato salad. I like your basic "Southern, after church, covered dish, yellow mustard potato salad". 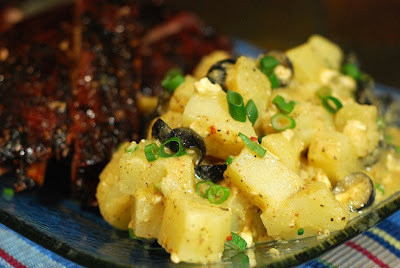 However, a few years ago, Robert at White Trash BBQ got me to try this Jalapeno Potato Salad recipe for something different. Before I go into the details, you have to go look at his blog to see the ridiculous picture of me that he included in his post. Trust me, it's worth the extra few clicks. Cook the potato in boiling water until it just starts to turn "fork tender". Mix the mustard, vinegar, garlic, salt and pepper in a mixing bowl. Slowly add the oil while rapidly whisking so you get a good emulsification (not separating). Drain the cooked potatoes and while still hot, add to the mustard mixture. 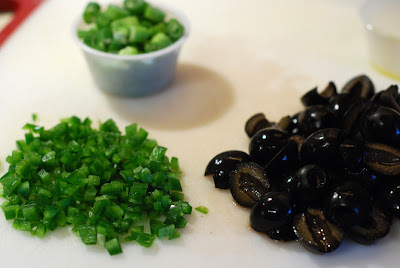 Fold in the black olives, green onions & chili peppers. While Bundy likes to serve her's chilled, I followed Robert's lead and like to serve this dish warm. The jalapenos give a nice crisp texture and really aren't very hot when they have been seeded and finely diced. This potato salad is quite a departure from the same ol', same old potato salad. I still enjoy a basic southern potato salad but this jalapeno version is now our favorite. The bold flavors of the feta, vinaigrette, and jalapenos bring it together. Speaking of different, several months ago, I receive a care package of free samples from the folks at Fischer and Wieser. One of the samples was their Roasted Raspberry & Chipolte Sauce. It has been neglected for one reason or the other until now. 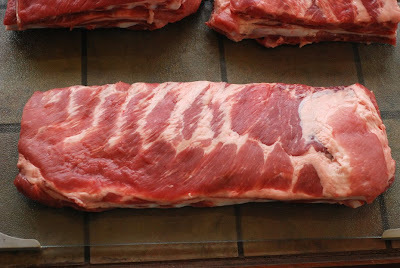 I had a very nice spare rib that I had trimmed St. Louis style (squared off). Actually, I had three, but froze two for later use. 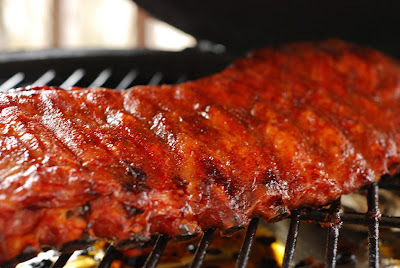 At 4 1/2 hours, the ribs were done. I used to do spares using the well known 3-2-1 method (3 hours naked, 2 hours in foil, 1 hour naked & glazed). But since I quit using foil, they are almost always done at 4 1/2 hours. Not sure why that is, but it's been consistent. I'll be honest, I was not sure what to expect from the raspberry chipolte sauce. In fact I was skeptical. 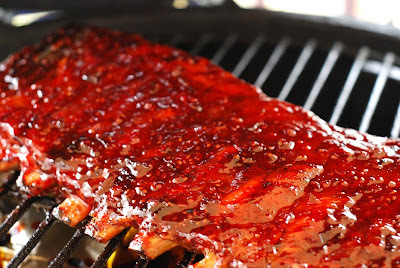 I'm happy with just "naked" or dry ribs but the rest of the family prefers sweet glazed ribs. 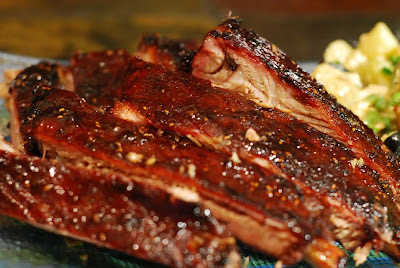 All four of us thought these ribs had a pleasing blend of sweet and savory tastes. 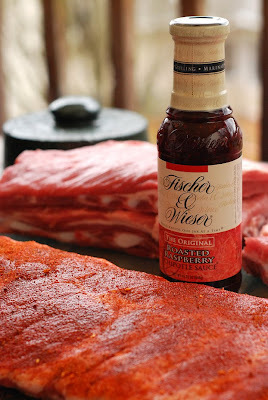 We eat a lot of ribs here so it takes something different to catch our attention and this finishing sauce did it. I liked them and they LOVED them. 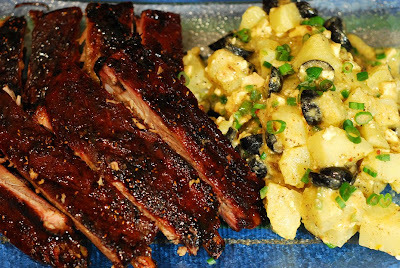 We'll definitely use this sauce on ribs again. Now that lunch is over, it's time to start thinking about dinner.